Old Exchange and Provost Dungeon > Blog > Museum Updates > Welcome Dr. Edwin Breeden! The Old Exchange Building recently hired Dr. Edwin Breeden to serve as our new Director of Research and Interpretation. Dr. Breeden recently earned his Ph. D. in history from Rice University in Houston, Texas, where he focused on the history of the American South. 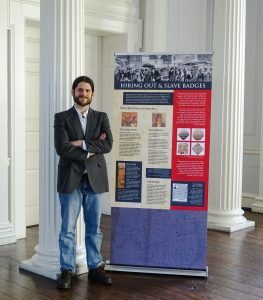 A South Carolina native, Dr. Breeden has worked part-time at the Exchange since 2014, leading efforts to explore the site’s historical connections to slavery and African American life in Charleston. We are excited to have Dr. Breeden as a full time part of our team. he will be revisiting many of the panels in our building in preparations for the 250th anniversary of The Old Exchange.